①主範(宗家) SHUHAN(Soke) » The founder and Grand master of Kishinuku.. Black belt with red logo and character. ②総師範(免許皆伝) SO-SHIHAN(Menkyo Kaiden) » License holder of Highest-instructor(one person in one country and can organize Kyoden-Kai on behalf of Shuhan). Black belt with purple logo and character. ③師範(免許皆伝) SHIHAN(Menkyo Kaiden) » License holder of General-instructor(one person in one dojo). Black belt with purple logo and character. ④奥伝 OKUDEN » All initiation. Black belt with gray logo and character. ⑤高伝 KODEN » High initiation. Black belt with orange logo and character. ⑥中伝 CHUDEN » Middle initiation. Black belt with orange logo and character. ⑦初伝 SHODEN » Elementary initiation. Brown belt with orange character. ⑧入門 NYUMON » Primer. White belt. "KishinJuku" is a style of traditional Japanese Jujutsu which does not use the Dan system. ❖"Menkyo-Kaiden" ◉completion requires individual direct teaching with the main instructor (1 hour x 8 times) *After completion, the student receives a Certificate, Scroll of license and Black belt for instructor. 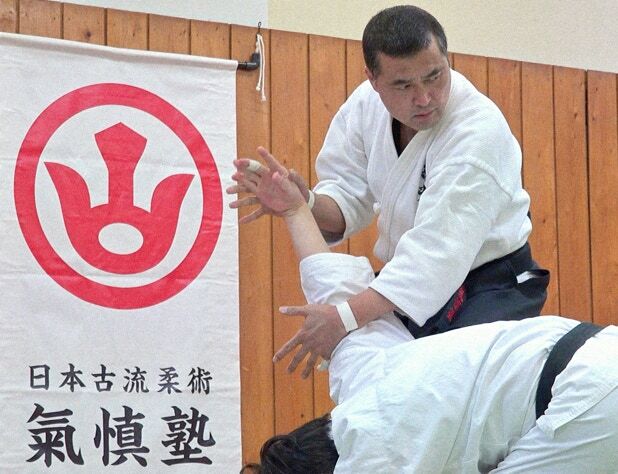 On top of being exempted of the monthly fee and special training fee in Honbu-Dojo, the receiver of Shihan-Menkyo is also allowed to teach other students. Also, if the receiver decides to start his own school, he is not required to pay for the headquarter fee and is free from the rules of the school. ※Please note that excepted for students of great aptitude towards "shin" (spirit), "gi" (technique) and "tai" (body), teaching will be limited to "Okuden" level. 1). Only those individuals who have attained the following “Menkyo Kaiden (Full Proficiency)” have qualification for establishing branch Dojo of Kishinjuku. The person is called “Konin-Shibu-Dojoshu (Branch Dojo Master officially authorized by Kishinjuku)”. 2). Konin-Shibu-Dojoshu can collect the charge of an admission and a monthly fee from a student at their discretion. Also, there shall be no payment duty to Shuhan in accordance with it. 3). Konin-Shibu-Dojoshu does not have the right to issue a "Kyoden Completion Certificate” or "Menkyo Kaiden Certificate (Certificate of Full Proficiency). This right only belongs to Shuhan, including the right to issue other items such as belts, and these shall be awarded to the students directly. 4). Konin-Shibu-Dojoshu cannot hold a seminar under the name of "Kyoden-kai (Shuhan&apos;s Seminar)", however, can hold "Rensei-kai (Formal training session)”, collect fees and sell officially recognized goods with the aim of obtaining profits from the participants at their discretion. 5). Only Shuhan has the right to produce and publish learning and training materials for “Kyoden Techniques”, such as DVDs or books. 6). "Menkyo Kaiden (Full Proficiency)" is the sole highest qualification given by Shuhan and signifies the practitioner has been taught all the techniques and principals of Kishinjuku and recognized to have achieved the unity of “Shin-Gi-Tai (Mind-Skill-Body)”. 7). "Menkyo Kaiden (Full Proficiency)" holder ensures the future prosperity of Kishinjuku and helps the development of the students as possible future successors. 11). Nintei-Dojoshu is a special student who does not have either"Menkyo Kaiden (Full Proficiency)" qualification, but is approved to open a Dojo. 12). Nintei-Dojoshu can collect the charge of a monthly fee from a student at their discretion. Also, there shall be no payment duty to Shuhan in accordance with it. 13). Nintei-Dojoshu does not have the right to issue a "Kyoden Completion Certificate”. This right only belongs to Shuhan, including the right to issue other items such as belts, and these shall be awarded to the students directly. 14). Nintei-Dojoshu cannot hold a seminar under the name of "Kyoden-kai (Shuhan&apos;s Seminar)" or "Rensei-kai (Formal training session)”, however, can hold “Keiko-kai (Training session)“ and collect fees at their discretion. 15). Nintei-Dojoshu does not have the right to produce and publish learning and training materials for “Kyoden Techniques”, such as DVDs or books. Also they do not have the right to sell or transfer officially recognized goods. These rights only belong to Shuhan. 16). Nintei-Dojoshu is required to participate seminars organized by Konin-Shibu-Dojo or Hombu Dojo (Kishinjuku Headquarters) a minimum of twice a year. Nintei-Dojoshu must take responsibility for being a special student, which includes endeavouring to improve their techniques. They are also responsible for teaching their students the techniques in a safe environment. 17). 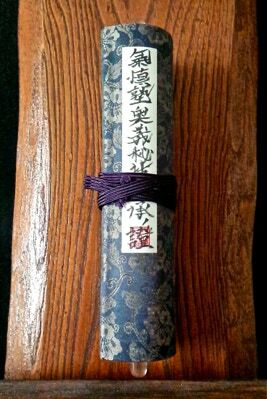 A fifteen-year period of grace is set in order to obtain "Menkyo Kaiden (Full Proficiency)" from the date of approval of “Nintei-Dojoshu”. The acquisition of Shoden, Chuden, Koden and Okuden are all required as set in the Kishinjuku terms. 18). Nintei-Dojoshu has the same responsibility as Konin-Shibu-Dojoshu for the confidentiality of Kishinjuku Aiki techniques and all the Kyoden techniques and principles. Therefore, if these techniques and principles are disclosed in anyway to other schools or bodies without Shuhan’s permission, such as in a seminar, Nintei-Dojoshu approval will be disqualified and revoked regardless of any reason.